Imperfectly Painted: OPI Y'all Come Back ,Ya Hear? Orange, is not one of my favorite colors. Orange did not hurt my feelings or call me names. It's just orange isn't my cup of tea....usually. Oddly enough, orange has become one of my favorite nail polish colors this season. I think orange in small doses (at least for me) I really like. I think it all started with China Glaze Papaya Punch, since then I've been on an orange kick. I like the vibrancy of orange, and it's a nice deviation from reds and pinks that I usually reach for on the warmer end of the color spectrum. 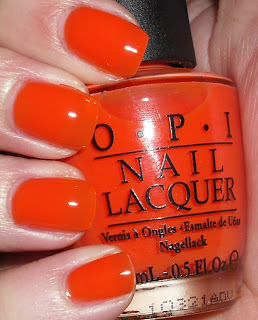 I love this sorbet from the OPI Texas collection. Ya'll Come Back, Ya Hear? is a vibrant medium orange jelly/sorbet. I love juicy colors like this. I don't think you can go wrong with the jelly/sorbet finish, it's one of my all times favorite. It's a great shade of orange too, it's definitely bright, but nothing blinding or crazy. Overall, Imperfectly Painted approved! Is there a color this summer you've been wearing a lot of? At my age I should steer clear of these vibrant colors but....I like this orangy color ! This summer has given us some very very pretty oranges. I love this color! I reviewed it a few weeks ago when I did my NY Mets manicure! I am loving Essie Brazilliant and every holographic polish I own this summer! I've been doing corals lately...oranges and yellows have been looking better too. This one looks fabulous on you, so I hope you keep going with the orange thing! I just love this, it's so pretty! :) I'm glad you're liking oranges a bit more, they look great on you. Gotta love a good jelly! I like orange for Summer, especially as a pedi color. Otherwise, orange really isn't a favorite color of mine. It looks lovely against your skintone!! I totally know what you mean about orange lacquers! I always shy away from oranges because it looks so.. not-me haha. Maybe a juicy bright orange jelly can ease me in. I just love jelly OPI's, I can't say no to them. I love this...I really need to buy it. I've been wearing a lot of coral this summer! I am not normally an orange polish gal either - but found myself getting some this spring to summer that are sure orange and not just coral. I have Kimmy from the Zoya Sunshine collection on my toes now...just got done doing them...it's a great deeper orange Zoya glitter but a glitter without the roughness and all the scrubbing to get it off. I got Essie's Brazilliant & a couple other oranges from OPI this summer too. There is great orange, Rica in the Zoya summer Sunshine collection for those who are not into cream oranges I highly recommend. I just got into orange recently, too. I loooove this one, I think it looks like little fingertip candies, hahah. I love this color! My mom actually gave this one to me because she didn't like it. Her loss! I have been into orange this summer, too, for some reason. I have never been a fan of orange in the past, and I can't wear it near my face for fear of looking all flushed and freakish (wow, that was a lot of f's!) I bought YCB,YH because I needed an orange for nail art, and I fell in love with it. Now I'm all about the orange, especially paired with navy. It looks great on you! As for me, I've been enjoying my greens; I used to not loving greens! This seems to be the summer of dusty lavenders for me. In fact, I realized that I had enough variants of Purple to pale lavender to do an ombre mani in those colors. Or water marble them, which is definitely happening. Orange isn't really my thing either although I would totally put it on my toes! I have to say, though, I love the name. One of my best friends is a cowgirl and I am tempted to buy that whole collection for her, just because I know she'd get a kick out of it!